A Johnston real estate developer wants to be the first private party to dig into the land left behind by the Route 195 relocation project, offering the state a multifaceted vision for its vacant highway property in the Fox Point section of Providence. Carpionato Group envisions a series of buildings and outdoor spaces including a hotel, town houses, a restaurant, research laboratories, three parking garages, shops and public spaces linked by pedestrian bridges — one a Ponte Vecchio-inspired span over Wickenden Street; the other a more utilitarian structure above South Water Street connecting a retail plaza to a park along the Providence River. It would cost an estimated $254 million and would support the equivalent of 900 full-time jobs. Carpionato has in the past proposed a large retail complex at the site of the old Providence Fruit and Produce Warehouse (which they tore down) and a hotel tower on the triangle parcel near Kennedy Plaza. Neither project ever happened. A suburban developer’s project design reviewed by a Commission chaired by a suburban developer, this is the problem with the 195 Commission. I was going to say, before reading your next-to-last paragraph, Carp has always been long on ideas, short on results. This property is far too important to entrust to a company with an established record for chasing pipe dreams. So… – Every popular urban neighborhood around the world came to exist how? SO because this commission exists, does this mean that Providence’s City Plan Commission Does NOT see it? Ever? What about zoning? does zoning ever get to weigh in, or does this commission have all the power and none of the knowledge? My understanding is that CPC will not see this and the 195 Commission is recommended but not required to abide by Providence’s zoning regulations. I could be off base on that though. There are some parcels that are not on 195 land and I’m not sure if they would be considered contiguous with the 195 parcels. One hates to rain on anybody’s parade, but there are some issues… such as how do they propose to assemble the properties they seem to have incorporated outside the I-195 parcel(s). 1. The magnificent row of town houses on Benefit? South Main? obliterates a bunch of existing structures currently enjoying useful lives. 2. The Ponte Vecchio is a brilliant solution to the pedestrian’s nightmare, highway engineer’s dream crossing of Wickenden St. Not that anyone would go up and over such a thing when he/she could enjoy the adventure of jayrunning across as we do now. 3. The marina is inspired! Dozens of boat slips right there in town. For extreme shoal-draft vessels. You can practically walk from that shore to the I-195 bridge piers at low tide. 4. Where’d the church get to? We’re probably looking at years’ more proposals like this. Three parking garages? Seriously? I’d love to hear the justification as to why they couldn’t make it work with just one garage. In all likelihood, Providence has zoning requirements for x number of spaces per square foot and/or per person, in terms of parking. I recently looked at Worcester’s zoning for something I was writing, and the lowest requirement I found was for restaurants, which required 1/2 a space per person. That doesn’t sound like a lot, but that’s 10 spaces for a cafe that only seats twenty people, and that’s in addition to any (state-funded) “free” street parking that exits. Plus, the spaces are required to be 18′ x 9′, if memory serves, with a 24′ wide aisle to drive your car into them, so that ends up being a parking lot bigger than the cafe itself. And since all of that is mandated by zoning, and then passed on through prices of goods at said cafe, the parking provided is not voluntary or market-driven. Most other space uses in Worcester require many more spaces per person, and likely Providence is the same. Cities worry that they won’t have enough spots to meet the demand for driving, but their assumption that parking has no cost means they’re plotting a demand curve with no price points. The demand is naturally way inflated. This is a place where removing a zoning requirement would likely at least allow the freedom to people who might want to develop the space better to do so. You get suburban developers because those are the ones with experience in what the city is mandating. As far as pedestrian bridges go, can I just say as a cyclist that I do think that pedestrians should have access to bridges, but that there ought to also be ample space for cyclists as well? I haven’t heard this idea even broached in discussions of the bridge. I think more than likely, there is going to be more need for people to bike through the area than walk. seems like that’s his only motive here… putting his name on it. Carpionato sounds like a total asshat. i’m sure the 195 commission chairman is all excited with the number of parking spaces proposed though. You know, the only think in recent memory that was a worse idea than this 195 Commission was the Red Sox signing Carl Crawford. How is this related to that, do you wonder? That was a terrible signing and I knew from the start that Carl Crawford was not ever going to fit into the Red Sox and Boston Sports Fan craziness, regardless of what a nice guy he is and what kind of player he was/is. It was just a bad match. This 195 Commission is about 20 years (or more) behind the times. Even as places like Northern Virginia are trying to urbanize because they see the value in walkable communities, and mixed use developments, and are cutting down the amount of parking and making commitments to Rapid Transit, we have these stupid suburban designs and plans. Even the Wegman’s down here has stacked parking. Out in the suburbs! Crazy, I know! Providence is just too damn small to have it suburbanized. It needs to remain urban in order to survive. It is such a perfect size for a city, completely walkable (generally) and great architecture, constantly evolving businesses and creative enterprise, and then this commission which seems to have no damn rules, pulls this kind of crap out of its hat. I say, turn the whole damn thing into a clover and wildflower meadow. Put 1000 hives of bees out there and maybe some grazing livestock (so that city kids can meat a cow up close), some horses for a community riding program, and several community small scale farms until someone shows up with a plan that knits the city back together and adds both quality of life and boosts the tax base. I mean, do you know how much pony rides go for down here? On second thought, I say f*ck economic development. Turn it all into greenspace, make Providence a place to live with quality of life benefits that are better than Boston and NY and the businesses and people will come. The pedestrian bridge people are talking about is connecting buildings over Wickenden Street. The pedestrian bridge over the river will allow for cyclists, though I don’t think cyclists and pedestrians will be segregated so it will not be an open speedway for cyclists who will have to interact with pedestrians on the bridge. This bridge (the Pointe Vecchio :rolleyes:) is bad urbanism. The streets should be built so that pedestrians don’t have to be shifted onto a bridge, and most pedestrians will stay at street level as climbing up to a bridge to cross the street is just silly. A pedestrian bridge at this location is especially egregious as we’ve just torn down the highway re-opening the east-west view corridor from Wickenden to the river and beyond, now someone wants to close that corridor and remove the daylight that has been created? Also, someone please explain how that sailboat at the marina got under the Point Street Bridge, not to mention the hurricane barrier. I do like the Marina and all the boat slips though, and the fact that there’s greenspace right up to the water which is important for public access. But there is no way on Cod’s green earth that Carp has this kind of capital to make this happen in its entirety and I don’t buy for one second that he would do it all. Does he still own the parcel where the HISTORIC produce market was? According to the Assessor’s Office, where the Fruit and Produce House used to be is owned by “Shops at Providence Place LLC” which according to the Secretary of State is located at the same address as the Carpionato Group. And for the record, to address Carpionato’s claim that splitting this land into separate parcels will inhibit development, I say that packaging all the lots together for a single entity to develop is the surest way to guarantee that 1) nothing gets developed here for a long time and 2) whatever eventually gets developed will be underwhelming and pseudo-urban. Exactly like this pie-in-the-sky proposal. Just a few random thoughts. This makes me very scarious (as an Japanese coworker use to say..scary/nervous). One, I think it’s VITAL that parcels be developed independently, to encourage the varied architecture and spaces which make PVD so cool and interesting! I, for one, don’t want to see blocks and blocks that all look like they were built at the same time and that will look dated in 10 years. Two, I was very surprised they wanted to knock down the Union building and parking lot along South Main….makes me go, huh…who do they know. I DID like the marina idea though, very cool. Lastly…as there ever been any talk about extending the historical commission into this area? RIght now the border is lower Benefit to the houses down Transit behind the union parking lot. Can they not extend since it’s new construction? Dunno…one thing for sure, this will be a long drawn out process. My intial thought, when I saw the headline, but before I saw the story was, “Please, God, don’t let it be Carpionato.” I echo many of the observations above. I”m guilty of wanting a bike speedway. Philadelphia’s beautiful Schuykill River Trail was something I loved biking, but it got so crowded with runners, strollers, etc., that it ceased at some points to be a good transportation route for bikers. Admittedly, if Providence got to the point where it had that kind of a problem, that would be progress, in a way. But I always think that planning for a ped- bridge should have segregated sections for bikes and walkers, to avoid that problem down the line. Carpionato’s bit that the sale of smaller parcels would lead to “inconsistent architectural styles” betrays a total misreading of urban dynamics, especially in this area whose richness has everything to do with its aesthetic and functional diversity. And in any event Providence should be sobered against these kinds of mega-projects, which are suburban in character–as a few other people have said–mainly because they strive to be self-complete instead of engaging with the streets around them. That said, I find the redevelopment commission chairman’s statement troubling that most of the land should be developed in 10 to 15 years, ‘although it may be 20 years or more before the last parcel is sold.’ If we were talking about a transatlantic skybridge, okay. But that’s an absurdly long time to sit on a mere 40 acres in the center of a regional metropolis. Three words: Fire This Commission. Why would anyone want the City Plan Commission or Planning and Development to have any influence over this development? Just look at the Gilbane project on Thayer Street, a luxury “apartment building” (dormitory) for Brown’s wealthiest students. For this terrible project idea, DPD and the CPC abruptly overturned the recently completed neighborhood plan, as well as the zoning ordinance and comprehensive plan. The institutional zone regulations were ignored. Nine historic homes will be destroyed for no good reason. Gilbane claimed the property would pay full taxes, but then Gilbane quietly went to the city council and disparaged the project in an attempt to get an artificially low tax appraisal and even more profitable tax discount That deal is apparently still pending. The Gilbane project is another windfall for tax-exempt Brown. Brown gains the equivalent of a new dormitory for which it pays nothing. The project is a huge loss for the taxpayers, both financially and culturally, especially for those who live in the neighborhoods near Thayer Street. Given their track record, let’s keep CPC and DPD far away from the I-195 project. Carpionato and large-scale urban developments just don’t mix. Hell, even suburban developments for that matter. Do not forget what he did to redevelop the old boy’s school in Cranston at Sockonasett (how’s my spelling?) Cross Road; “Chapel View”. 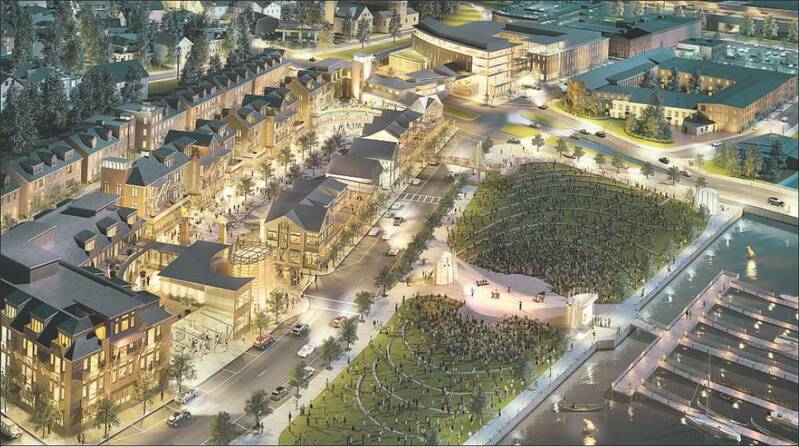 Large-scale mixed use development dubbed “lifestyle center” that is still not completed. Unbuilt parking structures. Supposed skywalks connecting new buildings to garages… they’re all unbuilt as of a few months ago. This project has been years in development and construction. The housing has taken forever to finish, partly due to the housing market crisis. I have not been there recently to see how much progress has been done and whether or not the residences are even finished… so I am relying on my recollections of a visit there in September, 2012. Jumping to another topic regarding the 195 Commission; I think each member of the commission should pick up a copy of Jane Jacobs’ “Death and Life of Great American Cities” and think about what they’re going to do to this once-in-a-lifetime opportunity for the city of Providence by possibly submitting to a single developer for a swatch of several parcels. Cities need diverse architecture. Cities need pedestrian involvement with the sidewalks to infiltrate the neighborhood, the stores, the parks, the businesses. One single garage would do the trick. Pedestrian overpasses are daunting at best; I’m a fan of raised crosswalks/humps/raised intersections for pedestrian safety. This proposal is just too suburban for an urban location. Consider his history in Providence and surrounding communities. Let him be with his strip malls and keep him away from urban development. That last Jason is not me. But I agree with him. Finding a hotel flag/operator should be fairly easy. At this location renting/selling apartments shouldn’t be a problem, but the proposed residential looks a little thin. This might be due to previous 2009 Redevelopment and Marketing Analysis, which set dwelling unit counts, as well as height limits. What’s referred to, as “infrastructure” is probably not water, sewer, electric, data, or gas, but rather a codeword for parking? Given proximity to the river and water table, 900 underground spots in this location isn’t necessarily a cheap proposition. That amount of parking would likely fit into two levels below grade requiring the creation of a “bathtub” to keep the water out. Alternately they might be considering creating a continuous below grade garage that goes under the proposed new side streets connecting the blocks underground and maybe fitting the parking into a single deck. Then there’s loading? The 2009 Redevelopment and Marketing Analysis proposed 520 parking spaces for these five parcels (2, 3, 5, 6, and 8), not 1,200. Perhaps the Carpionato is proposing more intense development? Lab and offices—Carpionato doesn’t have any tenants. Granted that this is just a concept, but without tenants it can be challenging to get financing. Without major tenants, it would be possible that only of half the project would get built. If Chapel View is an indication of Carpionato exterior design standards, this proposed development could clash with the character of the neighborhood. The Pointe Vecchio bridge feature might serve as a kind of gateway to Wickenden Street, but would pedestrians really use it? It seems more like throwback, which views Wickenden Street as highway rather than a neighborhood street. I like Liam’s idea. Let’s drag this commission into the 21st century and crowdsource this bad boy. Just think of the kickstarter money we could raise to rebuild a section of the city! I seriously question if this commission and all those making development proposals actually care about how this land is used. This is a once in a lifetime opportunity for Providence so we really have to do this right. Seems to me like all of the proposals thus far have lacked effort, creativity, and originality. Yea, a hotel and townhouses sounds cool and all, but how will such developments create a sense of “place”? Something unique has to be done with the area in order to entice people to live, work, and move their businesses down there. I have a lot of ideas on how this can be done. Whatever the city chooses to do, we’re going to have to live with it for the next 50-100 years most likely. I don’t really think this is all outright terrible, the biggest issue is that Carpionato has no track record of being able to get a project like this done, and worse, in the case of Chapel View has a record of only being able to get a project like this half done. It is really not worth getting too worked up about as far as I can tell. They have no financing and no tenants lined up, I mean what is that? It is really no more than a game of Sim City writ large on the pages of the Journal at this point. Looking at it in pieces, as pieces are the only way I can see any of this being built, there are some inoffensive buildings here. The building in the foreground on the left is not genius, but would be fine so long as it weren’t carbon copied for the length of the block. The townhouses on South Main are a vernacular that Providence lacks (and maybe it shouldn’t be there since this lack of form makes it out of place). They could be nice, judging from Chapel View though, I would not hold my breath on materials, and no design review from CPC or HDC means less scrutiny for the materials. The “Ponte Vecchio :rolleyes:” (you have to roll your eyes both literally and virtually when saying that) would be value engineered into a sad gerbil tunnel and then probably value engineered away completely (and good riddance I would say). I can see underground parking getting value engineered and the developer coming back to the 195 Commission asking for just a little bit of surface parking. Then oops, we can’t get a tenant over here for this parcel, can we have some more surface parking, ‘temporarily, we promise.’? There’s no way any of this would come off in anything like one phase, and the 195 land is not supposed to be allowed to be land banked, i.e. developers are not supposed to be allowed to buy it up for ‘future’ projects (and then sell it off when values go up, or park cars (like Capital Center) or whatever). Bill’s right. What good is CPC review when they approve crap like Gilbane’s gated community on Thayer Street? Whether the Carpionato Group concept becomes a reality or not, they should be given credit for having put a vision on the table. It’s easy to criticize their idea as being too uniform, suburban, histrionic, not dense enough, or having too much parking, but by creating this vision they began a dialogue. Though their record of incomplete projects, demolitions, or vapor-scrapers is a legitimate concern. Design is a process. Whether it’s an individual building or large-scale master plan, what’s provided in any initial image rarely becomes part of what’s finally constructed. Also, there are other contenders for the sites, the commission, the city, and public opinion, all of which will ultimately inform what gets built on these blocks. Previously only uninspired planner diagrams of the blocks were available. http://www.riedc.com/I195.pdf They did everyone a favor by provided an image of what potentially could be achieved. The 195 Commission is bound by the Providence Zoning which is why the City frantically rewrote the downtown zoning in Spring 2012 because they had to meet a June 30 deadline. However, the 195 commission does have the power to grant variances from said zoning. Please remember that there are other proposals for the land which make more sense than Carpionato’s. Also, the Carpionato team was very arrogant when they presented to the commission. This is not a foregone conclusion, just a PR piece. Suzanne, doesn’t having the power to grant variances mean that the 195 Commission is effectively exempt from the zoning ordinances since no proposal has to go before the CPC? Who are the architects, urban designers, and/or landscape architects who drew this? Why not just sell off housing lots (maybe 3,000 square feet or so) and let people build houses – maybe a few people would cobble together a few parcels to build larger multi-family and a mixed use edge. Basically, why are developers the only ones who can build a project now … why can’t we just have lots and people build a house like the city was built for centuries ? Interesting point, Ada. That never even crossed my mind. Ada’s suggestion is what I said way back at the start of the damnfool 195 commission. Just auction off lots, in phases, on conditions: No surface parking and if nothing is built in 2 years, the sale reverts. Now I would add the condition that any parking be offered on its own, at market rates and not bundled into the sale or lease of any dwelling, shop or office. I agree with the auctioning off of lots with conditions like no surface parking. But I’m not sure Ada’s suggestion of just having people build houses is good. Is it zoned for residential? We do want it to fit in with a good plan for the city, and I’m not sure houses are that. Houses (which presumably means 1-3 family homes like much of the rest of the city) decreases density. Let’s see what happens if we let people will build what they think the market will support. Houses, shops, offices, lofts, maybe even parking garages. The outcome is unlikely to be worse than the dullsville we are on track to get if we live long enough. Property tax revenue will come sooner, too. BTW is a chunk of this once in a lifetime city-transforming tabula rasa being set aside for a public school? Funny how I am often the biggest Marxist troublemaker in any crowd yet here I am calling for a free-market approach while the powers that be in the land of the free will consider nothing but central planning. There are several problems with splitting the parcels into housing lots and trying to recreate neighborhood fabric. There’s the problem that Jim brought up of density, we need more people downtown and building a bunch of triple deckers in the downtown where we could be building multi-unit towers doesn’t make us dense enough. The historic form of neighborhoods like Federal Hill or Smith Hill (or the Jewelry District before the highways tore through it) of closely spaced two and three family homes on small lots is no longer part of our zoning. That is a surmountable issue, but an issue nonetheless. Cost. The land downtown is far too valuable for a small outfit to acquire and build small housing lots. Large developers are the only ones who could build a project that can be financeable and profitable on the land downtown. I new public school in the Jewelry District would be cool. Would potentially be a good school too since it would be funded by property taxes, which I assume would be high in that area of downtown. A public school? Downtown including the Jewelry District has a population around 5,000. The two dominant demographic groups are people under 30 or over 50 without kids. Who would populate such a school? The current design model for public schools even within city typically is a sprawling single-story structure with large amounts of open space more typical of the suburbs. There’s a public school less than mile a way from the Jewelry District in Upper South Providence that due to lack of population, as well as budget constraints is slated to be closed. What does a public school have to do with increasing residential density, reenergizing the economy, creating jobs, and increasing the city’s tax base within the city’s Central Business District? If this is true, then a Large Developer will gladly outbid small outfits to assemble the right parcel for a financeable and profitable project. If it is not true, no Bureau of Central Planning can make it true. This is what they taught me in Econ 101, and 201 and 202. That is as far as I got in Econ so maybe I am all wet here. All Central Planning should do is install the streetcar line (well proven multiplier of downtown land values) and utilities, lay out an assortment of large and small parcels and auction them off in enough stages to avoid momentary gluts. Where are the free market think tanks and market ideologues to back me here? This is enough to make me think they all really only front for crony capitalists. And about the school, I say reserve the parcel just in case the population takes off like we all seem to hope it does. Pittsburgh built a successful school for the performing arts downtown, so I would not wholly rule out this use. The big picture is that we all want to see round the clock vibrancy and success for this neighborhood. Providence is a city amenable to a more pre-1920’s layout. The problem is that rather than land use being tailored to the needs and parameters of a more dense construct (which Providence is), we have a zoning system which is set up to favor large developers that have the resources to influence local government and bend the odds of having their corporate and soulless projects developed in their favor (see 257 Thayer Street as well as this proposal). To make matters worse, there is no urgency on the part of local government to change this arrangement, at least none that I can see. It’s a frustrating situation, and until there are more voices in opposition which can change this paradigm, we can expect more “lip-service” for smart growth policies from our officials but no real progress. I’ve heard there are some in the city advocating for a Downcity school of some sort. As Towne Street said about Pittsburgh, it would likely be some sort of magnet specialty school attracting students from around the City. With that, it would be better suited Downcity than in the Jewelry District or 195 parcels as all the buses come in to Kennedy Plaza and proximity to that would be key. Also, I think we could reuse an existing building downtown, or expand an existing building onto a neighboring parking lot to house such a school rather than having a suburban form. I’ve said it before and rarely does it get a response, which is that the current zoning regulations are doing serious damage from encouraging strip retail to surface parking to requiring parking everywhere to making it nearly impossible to construct a three-decker without a suburban-ish sized lot. As it has been suggested to sell off the 195-land as small parcels for three-decker development, if that was done in place of the Carpionato plan or another developers, the new buildings on those blocks would be far more spread out than in old neighborhoods and the result would be lower population density than Smith Hill, Federal Hill, the West End, Olneyville or Fox Point itself. Further the “new” three-deckers would be stubbier due to height limits and would have fewer rooms due to their smaller footprints because of lot coverage maximums. In other words under the current zoning a new three-decker neighborhood would look nothing like historic ones. The rules might fit some 1950s ideal of what they believed at that time what the city should look like, but it wouldn’t look anything like Providence does today. Back to Carpionato plan, the reason why the north blocks look so thinly developed is due to the underlying zoning. Carpionato’s renderer may even have cheated a bit increasing the density to make the image look more filled out. Everyone likes to hang their hat on the underling zoning proclaiming why do we have rules if no one obeys them and blaming greedy developers for changing them, proposing too much or whatever. The problem isn’t developers or an individual home builder, the problem is the zoning, which no one except myself is discussing. Peter. I think I have also been fairly consistent in my criticism of the current zoning. The question is, why is nothing being done about it? My guess is that only the large developers have the resources to navigate the current development maze and have their projects approved, so they want to exclude the potential of competition. Next, a vocal set of people have this visceral fear of density for whatever reason. Finally, dense housing means an increase in the supply per building/acre/whatever, and an increase in supply means a decrease in price. For all of the lip service paid to affordable housing and the benefits in terms of its social impact, a good number of people would balk at such a zoning change that encourages density if it meant that their piece of the pie is at risk of decreasing in value. In other words, the current zoning in Providence excludes those outcomes that are not beneficial to those who are enriched by its current incarnation. So the question becomes, how do those of us who favor a pre-zoning built environment overcome this? Unfortunately, the answer is not easy to calculate. Architecture is language. What is the message of schools that are visually indistinguishable from truck depots or, except for the barbed wire, prisons? Repurposed buildings are only sometimes an improvement. While we are dreaming here, how about a new urban school that expresses faith in the living future by its choice location and dignified architecture? Peter B, I think you get little response to your spot-on remarks about zoning because everyone here agrees with you. And Towne S is right about why the stupid rules are so hard to change. What is to be done? Get more people to read this blog. GC:PVD has over a thousand Facebook likes. That can be a powerful force. The question is, how do we mobilize them? Towne S, I’m not sure that it’s the developers. They don’t need to exclude competition and they’re not competing with small builders. Developers either already own a property or if they don’t they compete amongst themselves, especially with the 195-land. Usually if they have an insurmountable zoning problem that can’t be addressed through normal channels, legal CPC or DPD variances, they’ll often go directly to the city council for a special vote to approve a project that’s outside of the zoning. Other than some planners within the DPD, I doubt that most people in the city government understand the zoning or its impact on the built environment. The fear of density people probably intimidates politicians, so even if they do understand the problem, they might avoid talking about it. A comparative study of the current zoning code with 1950s and 20s code and how those codes relate to the majority of city lots and buildings that were platted or built prior to any zoning being in force might be a place to start. Another could be to compare current aerial photographs with historic ones, though this would be an expensive proposition as there are full sets of aerial for Providence exist from 1955 and 1963, but only available from a website historicalaerials.com. Check those out if you’re interested in seeing what the 195 land looked like prior to the highway. I’m a home owner in Downcity and I would welcome density and more affordable housing. I doubt the short term hit from increased supply would be greater than the long term benefit of a larger, more vibrant community.There are about 5000 people Downcity + JD. If that increased to 10,000 I’m certain my place would increase in value, not decrease. 1) Projects that are not likely to actually be completed because of scale, resources, and complexity. This is a guaranteed way to have infrastructure and investment that doesn’t work and can’t easily be fixed. 2) Projects that are designed for folks in cars to get into and out of as easily as possible. If the project is designed for personal vehicles it will fail to integrate into the surrounding neighborhood. The I-195 land will have its maximum impact when it’s highly integrated with the surrounding neighborhoods. It should draw people in from the city of Providence and guide folks out to the city of Providence. 3) Projects that will take a really long time. I think our goal should be to fill the space and fill it fast. I think the reasons for this are somewhat obvious. 4) Projects that are single use and capital intensive, especially from a less “stable” player. If we build a huge space for some speciality manufacturing process or lab space and then the tenant leaves in 10 years or fails, we’re stuck with a huge expensive building and capital infrastructure that’s hard to modify. The likelihood of a new tenant with the same needs are low, and the upfront costs of a conversion are high. If we get buildings of the right scale, they should stand for over 100 years. Single use spaces is the way to ensure long periods of vacancies. Steve, Thanks for the link to the RIGIS aerials. It’s a great resource. A current zoning issue going to the Zoning Board of Review March 6: A non-profit with a building on Smith St in the Elmhurst section used for small classes and cultural events has 4 parking spaces though back to back. (A garage had been converted to a small library and meeting room.) Current zoning apparently requires 10 spaces! Even though there is plenty of parking on Smith St and side streets, and the 2 interns are given monthly bus passes instead of parking. (there is the good #57 line on Smith St) To meet zoning requirements an entire lawn on the side street will have to be paved over. Do you think the Board will grant the variance that the non-profit is asking for? Are there any groups in Providence that would help preserve green space in such situations? Developer Carpionato Group, based in Johnston, R.I., and Boston, envisions a vast 62-acre mixed-use development. Tiverton Crossings would be made up of about 18 buildings, including a 10,000-sqaure-foot conference center, a 100-room, three- to four-story hotel and two 45,00-square-foot retail buildings. The project would also include mixed-use buildings, with retail, office and residential space. No buildings would be closer that 90 feet from the sidewalk, Carpionato Senior Vice President Kelly Coates said. So, Chapel View part 2? A “new urbanist” mess set 90 feet from the sidewalk. Why? And I’m sure they’ll finish Chapel View, build this Tiverton Crossings business, the proposal on the 195 Land, all while they need to turn the old Fruit and Produce site into a parking lot because they can’t make anything work there. You have all of this down city area and you want to build houses? Develop med/tech commercial space, poach businesses from mass with tax incentives. Providence barely has any TRUE class A commercial space. Again, I think Carpionato Group needs to prove that they can get one thing done before we entertain them developing anything else in Providence. I have no doubt, they would buy all this land, build some little thing (maybe), and ask for “temporary” surface parking on the rest of the land for a decade(s). On what will happen if the commission passes on Carpionato’s proposal, [Carpionato Senior Vice President Kelly] Coates said Rhode Island could face decades of fallow land costing taxpayers money instead of generating revenue. Have you never visited any of the other sites where you have made proposals in Providence? This seems to be mostly based on a press release as the 195 Commission met in Executive Session (closed to the public) to discuss bidders. The Carpionato Group, a commercial real estate development firm in Johnston, has submitted a proposal to the Route 195 Redevelopment District Commission to develop former highway land east of the Providence River, spokesman Gregg Perry told The Providence Journal Tuesday. Carpionato proposes to build on five of the six land parcels available on the eastern portion of land vacated by the state’s Route 195 relocation project. The name of the proposal has changed from “thePromenade” to “theConnection at College Hill,” Perry said. The proposed size for various buildings has changed since that early plan. 1. That proposed name made me gag. 2. We should not be entertaining the idea of selling 5 of the 6 east side parcels to a single developer to build a lifestyle center in the middle of the city.